Crunching the Numbers: Is a Luxury Apartment Really Worth It? Do the words "luxury apartment" conjure up visions of dollar signs flying out the window? A luxury apartment may have a slightly higher price tag attached, but rent comparisons go deeper than face value. Take a look at some of the upscale amenities that are included with our Springs luxury apartment homes and how they can actually save you money in the long run. 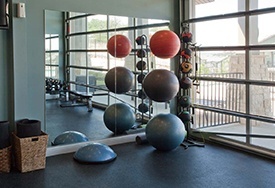 According to research site Statistic Brain, the average monthly cost of a health club membership is $58. As if that's not enough to give you pause, you pay that fee no matter how much or how little you use the facility, and Statistic Brain estimates that $39 of that monthly charge is wasted. It adds up to almost $770 per year, not even taking into account travel expenses to and from the gym. Caffeine addiction doesn't come cheap these days. U.S. News & World Report puts the average price of a brewed cup of coffee at $2.70. If your taste runs to gourmet drinks such as café mocha, you can expect to pay close to $4. The total bill for one cup of java five days a week? Anywhere from $700 to $1,000. Personal finance site The Simple Dollar priced out the various elements of doing laundry at home vs. at a laundromat. Savings per load came out to $2.15 per load, so even at a conservative estimate of two loads per week, that's an extra $225 in the bank each year. A clean car may not really run better, but it's certainly more fun to drive. Consumer review site Angie's List estimates that the cost of a basic car wash runs from $6 to $9, with premium services such as wheel cleaning and clear-coat protection tacking on additional charges. At one wash per month, annual savings can run from $75 to $250. When you look at the real costs, how can you NOT afford a luxury apartment? Your time, convenience and comfort are priceless. Stop in today and talk to a helpful member of our friendly on-site management team to learn more about these and other amenities that put Springs Apartments above the rest.